Tarek Bouchamaoui is a tireless Tunisian company director who splits his time between Tunis and Cairo. Now in his 50s, he has been at the head of HBS International, a company dedicated to oil and gas exploration and production in Egypt, since 1997. Together with his family in Tunis, he has headed a diversified group with HBG Holding at its centre since 2012. Following his father Hédi’s footsteps, Tarek Bouchamaoui reflects his family history, characterised by the values of hard work and generosity. An active citizen, driven to contribute to the social progress and development of his country, he believes that business alone is nothing if it does not benefit the population as well, if it does not serve to create values, jobs and training, and bring wealth to his partners and his country. Tarek Bouchamaoui draws on his family history and emblematic father figure, his own force of character and desire to continue the work of the man who showed himself, though autodidact, a brilliant and courageous entrepreneur. Born in 1932, Hédi Bouchamaoui started working at 14. He enjoys challenges and has a great sense of responsibility and spirit of initiative. Soon, he sets up a family-run civil engineering company in the South-East of Tunisia, in his native Bouchama. Soon, he starts to specialise in hydraulic infrastructures as well as the set-up and development of agricultural lands across the Tunisian territory, reaching as far as Libya. He has been granted large projects and employs up to 5000 people. Audacious, rigorous and a man of his word, he is an honest and trustworthy partner, which enables him to access the closed petrol industry world. 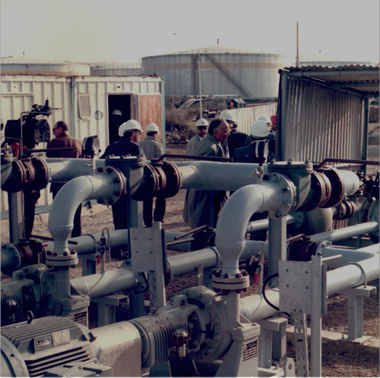 In 1968, the company turns toward the installation of pipelines for gas and crude oil and changes its name to “Bouchamaoui Activités Pétrolières”. 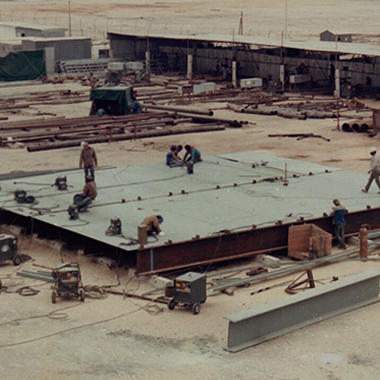 The year 1984 is decisive for BAP, which is entrusted with the construction of an oil platform off the Gulf of Gabès. It is the first Tunisian company to distinguish itself in this field. 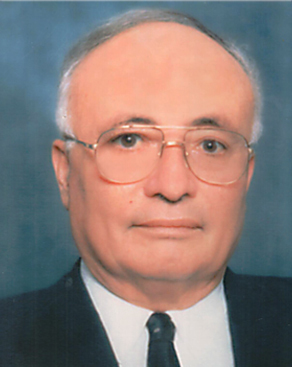 Hédi Bouchamaoui passed away in 2009. While the father of Tarek Bouchamaoui is driven by an exemplary zeal for work, he is also concerned to pass his business acumen on to his three sons and four daughters. During the holidays, he sends them to work as interns in his companies. It is therefore only natural for Tarek Bouchamaoui to continue the family tradition, especially as he is passionate about the various activities of his admired father. On his advice, having completed his baccalaureate, he pursues his studies at Michigan State University in the US, obtaining his engineering degree in 1991. Out of seven brothers and sisters, six pursue university studies across the Atlantic. By spending time with Americans in the course of business, their father had understood that, apart from the importance of practicing English, their rigorous way of working makes for excellent professionals. Applying these standards of professionalism to himself, he wanted to inculcate them in his children while opening them up to the world. This way, they would possess all the necessary assets to succeed him. Back in Tunisia, Tarek Bouchamaoui starts off in two of his father’s companies at the same time, Bouchamaoui Activités Pétrolières and a spinning factory. He occupies each function successively (labourer, foreman, engineer, supervisor, etc.) in order to acquire solid experience. He supervises the worksites, ensures the implementation of projects, he organises and controls operational expenses and actively contributes to the elaboration of the group’s strategy and the creation of synergies. Owing to this first multifaceted experience, in 1993 he takes over the general executive management of HBS Oil Company (Hédi Bouchamaoui & Sons), which Hédi Bouchamaoui, having obtained an oil prospecting license, had just founded. 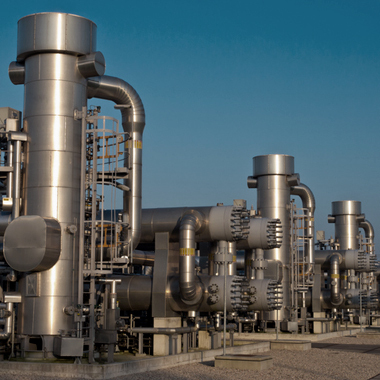 It is the first privately owned company specialised in the exploitation and production of hydrocarbon in Tunisia and Africa. In this company, he acquires extensive experience, overseeing all the stages from exploration to drilling. Unfortunately, the oil and gas production does not fulfil the company’s hopes. This experience in hydrocarbon prospecting will, however, help him to bounce back. Indeed, it will represent a precious point of reference that will allow Hédi and Tarek Bouchamaoui to win a call for tenders for oil prospecting in Egypt. 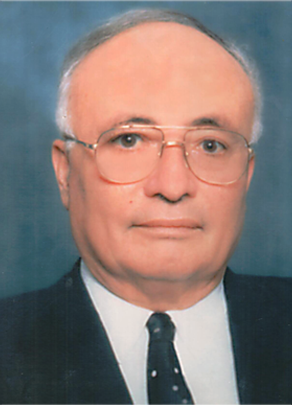 In order to make use of the resulting oil prospecting licenses following the call for tenders, in 1997 Hédi Bouchamaoui creates HBS International Egypt in Cairo. Tarek becomes its managing director and stockholder, along with the other members of the family. It is the beginning of an exceptional personal and professional adventure for him, and an important success for the company, whose production levels reach up to 25 000 barrels per day. In 2017, the company is exploiting various gas and oil fields and still holds four oil prospecting licences. It is a source of employment and specialised training for 250 people. It demands the constant attention of Tarek Bouchamaoui, who, for this reason, has chosen to live in Cairo, now his principal residence for many years. Following the Tunisian revolution, the Bouchamaoui group – which up until that time had kept itself at a distance from the Tunisian business world – decides to participate fully in the new era, open after the fall of Ben Ali. The repatriation of a significant sum of capital from Cairo to Tunis allows the creation, in 2012, of HBG Holding, as well as substantial investments in many sectors: automobile, agriculture, distribution, real estate, financial services and fast-food, among others. On this occasion, the company abandons the family-led mode of operations for a “corporate” approach, separating operational and strategic management. External experts are recruited for the operational management, while the Bouchamaoui family (as stakeholders and members of the board of directors) defines the strategic orientations, future investments and acquisitions. Consequently, two ambitious and innovative projects, of the kind that Hédi Bouchamaoui loved, are created in the South-East of Tunisia, the region from which the family originates. 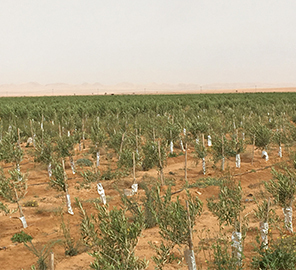 The first concerns the development of 750 hectares of agricultural land into arboriculture in the Matmata region (Gabès governorate), known for its microclimate and early harvests. 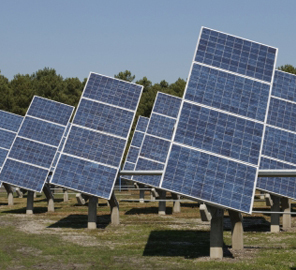 The second is designed to take part in the development of sustainable energy, with the construction of a photovoltaic solar plant with a capacity of 10 MW on a field of twenty hectares. Its start of operations is scheduled for January 2020. If Tarek Bouchamaoui follows in his father’s footsteps with the same sense of righteousness, the same will to innovate and the same personal investment, he also inherited his father’s love for his country, his sense of generosity in the service of the whole of society. As such, he is vice-president of the Réseau Entreprendre Tunisia, which aims to contribute to the success of new entrepreneurs, creators of jobs and wealth. In this, his vision is shared by his sister Ouided Bouchamaoui, president of the Union Tunisienne de l’Industrie du Commerce et de l’Artisanat (UTICA, Tunisian Union of Industry, Trade and Handicrafts) since 2011, and laureate of the Nobel Peace Prize, along with the Tunisian National Dialogue Quartet, in 2015. This prize was awarded in recognition of the efforts made to ensure a democratic and peaceful transition in Tunisia. Other Tunisian companies today share the same preoccupation of fulfilling a broader role than their own economic activities. Tarek and his family, guided in this by their father, were forerunners and cherish the hope that a larger number of others will soon follow them in this collective effort. In 2016 Tarek Bouchamaoui, along with his brothers and sisters, creates the Hédi Bouchamaoui Foundation, in order to continue his father’s engagement in the field of education and culture with full transparency and within a dedicated legal framework. The foundation has made possible the renovation and modernisation of twelve primary schools in the Gabès region. At the start of the 2016/2017 and 2017/2018 schoolyears, it launched the “Schoolbags for all” initiative, providing schoolbags and school materials to children from several schools in this region. On November 8, 2017, in collaboration with the Regional Directorate of Education, the foundation participated in a seminar on the theme “How to improve the Baccalaureate results in the Gabès region”. Its aim was to draw conclusions and diffuse these throughout the whole country. Finally, the foundation intends to expand its activities in the field of health, in particular within hospitals. A man of passions and commitments, to his family, his companies, his country and his native region, Tarek Bouchamaoui isn’t satisfied to simply travel the world for his business and to perpetuate his father’s industrial and humanitarian work. He has another, more personal passion for football, which has led him, over the years, to occupy the highest positions. Since 2011, he has been a member of the CAF (Confédération Africaine de Football) executive committee, and since 2015, he has been a member of the board of FIFA (Fédération Internationale de Football Association). As with his fight to contribute to the recovery of the Tunisian economy, he also dreams of raising the level of African competitions, and allowing Africa to soon play a major part in this field on the world stage.